Mahanarayan oil - a traditional Ayurvedic remedy, made according to ancient recipes, which includes more than thirty extracts of medicinal plants. These Medical components of the oil penetrate deep through the skin to the place of inflammation, providing high efficiency treatment of painful joints and spine. Natural vitamins & minerals present in Sattva Mahanarayan oil provides the drug action at the cell membrane level, normalize inflammation processes in the affected tissue and the calcium metabolism. The basic properties of Sattva Mahanarayan Oil. Deep tissue penetration of joints. Elimination of inflammation and edema. The stimulation of regenerative processes of cartilage. Mahanarayan oil effectively in problems such as arthritis, salt deposits in the joints, muscle pain, as well as all sorts of paralysis and tremors. The oil is used in general fatigue, to recuperate in order to ensure ease and mobility of joints and keep them in good condition. It gives a nice effect in the inflamed joints and sedentary. Used in the treatment of diseases of the spine. Mahanarayan oil normalizes blood circulation. Has beneficial effects on male and female reproductive organs, increasing power of sexual desire and fertility. Used in all types of rheumatic complaints, very effective for pain in the chest, lymphadenitis, and degenerative diseases of the body. Mahanarayan oil warms, nourishes, protects the joints and gives the body Fortress, strengthens the protective layer of the energy (the aura). Mahanarayan oil is used for local and general body massage. Cosmetology - Sattva Mahanarayan Oil is used in the treatment of rosacea, varicose veins and problems associated with impaired blood circulation in the body. It gives the skin firmness and elasticity. It is used in lifting and anti-cellulite programs, comprehensive care for aging skin. 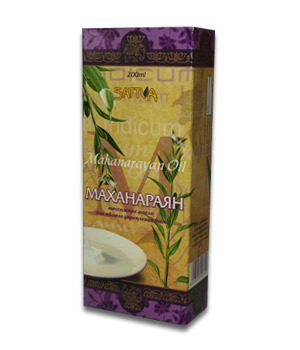 Sattva Mahanarayan Oil - soft, warming nourishes and protects the joints. Ideal for massage during the cold season. It strengthens the bones and joints. It makes the body strong and healthy. Sattva Mahanarayan Oil not only reduces pain, but penetrates deep into the skin and tissue, destroying the salt deposits, calming inflamed tissue, thus eliminating the very cause of the pain. It removes various muscle and nerves pains. Post-traumatic and degenerative-dystrophic diseases of musculoskeletal system (joints and spine). Sport and household injuries of joints, ligaments, tendons and muscles. Sattva Mahanarayan Oil is used for general fatigue, to restore and ensure the ease and mobility of the joints and keep them in good condition. Apply a thin layer of oil to the affected joints or the spine and rubbed soft massage movements. It is recommended to take a hot bath for 10-15 minutes or to impose on the region of the joints hot bandage or wrap to make hot - in the case of diseases of the spine. The course of treatment in acute 7 - 14 days, chronic - 1 -2 months. Warnings: Sattva Mahanarayan Oil is for external use only! Sesamum indicum oil, cow milk, Asparagus racemosus, Withania somnifera, Borhaavia diffusa, Clerodrum phlomidis, Oroxylum indicum, Stereospemum suveolens, Paederia foetida, Solanum indicum, Solanum xenthocarpum, Sida cordifolia, Abutilon indicum, Tribulus terrestris, Aegle marmelos, Foeniculum vulgare, Cedrus deodara, Nardostachys jatamansi, Acorus calamus, Santalum album, Valeriana wallichii, Saussurea lappa, Elettaria cardamomum, Phaseolus trilobus, Teramnus labialis, Desmodium gangeticum, Uraria picta, Pluchea lanceolata, Azadirachta indica, Parmelia perlata, Rock salt. Apply to the affected area a small amount of oil and massage gently 2-3 times a day or as directed by the physician. For the prevention of diseases of the joints, relieve stress and to relax - made full body massage, except for the head. The oil is recommended to rub until completely absorbed, and leave on the skin as long as possible. joint pain, arthritis, osteoarthritis, gout, rheumatism, aches and pains in the neck and back. It is useful to massage for children from 6 months to strengthen the body. Effective for total body massage for paralyses & for older people to improve the overall condition, for athletes to strengthen their muscles. Do not use on cuts, wounds and burns.